Opinions on how to prune deciduous fruit trees are innumerable. I have just one: Keep your tree small. I believe it’s the single best thing you can do if you want your tree to produce fruit and you want to pick and eat that fruit. But if you let a tree get tall, then the fruit is borne primarily high up, out of reach. Trees generally fruit most in the part of their canopy that gets the most sunlight, and that’s toward the outer and upper part of their canopy. I once had a plum that was 15 feet tall, and while a bit of the fruit was within reach, most of it was out of sight and only accessible by ladder or pole, or squirrels and birds. In the end, most of that fruit was lost to the critters. My current plum is about eight feet tall and I have never lost a single piece of fruit to animals, and despite its smaller size it is still big enough to produce more fruit than we can eat. A small tree can be protected if necessary. My aunt has a small peach tree which she easily covered with a net once the birds discovered her fruit and started pecking it this last summer. Try covering a 15-foot tall peach with a net! Yet I haven’t even found the need to net my own small trees. My Blenheim apricots attract scrub jays as soon as the fruit begins to sweeten. The birds peck some of the ripe fruit but don’t ruin it. That fruit is at head height on my tree, so I immediately notice it and pick it. I take their peckings as a sign of ripeness. “Eat this fruit, Greg. It’s ready.” There’s still so much more fruit on that little tree that the birds never touch. I don’t like the idea of telling you how you should grow your fruit trees. Truly, do whatever you want. But after having many trees both big and small, I’ve found that small is better. I’m in good company, by the way. I don’t know of many people with a lot of experience with deciduous fruit trees who let their own trees get big anymore. So, how to achieve this goal of a small tree? The topic of pruning can be studied for a lifetime, but the achievement of a small and productive fruit tree can be had with very little knowledge and little work. For each one of my trees, I prune them once in the winter (just finished my pruning yesterday) and once or twice in the summer. The total time involved is around an hour per year per tree. What do you need to know in order to do the pruning? Tough question because obviously the more you know the better your pruning is likely to be. On the other hand, you could literally shear your fruit tree as though it were a shrub and still get decent results. 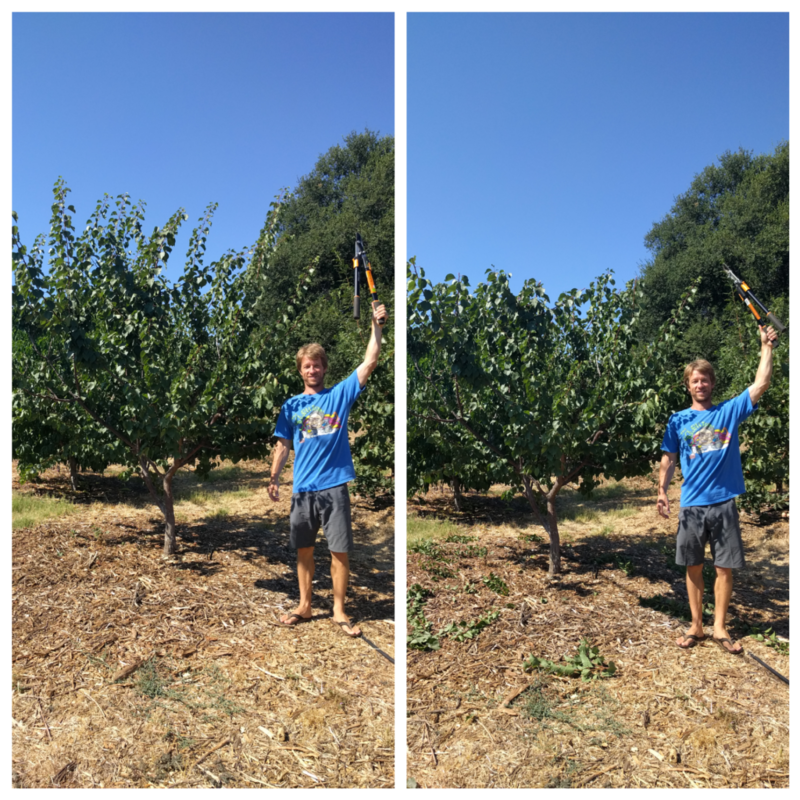 Shearing a fruit tree is actually a thing, the “fruit bush” style it is called sometimes. Try it, or dive deeper into the resources below, which are the best ones I know of. As an aside, if you want to keep your fruit tree small, also remember not to counteract your pruning efforts by pouring fertilizer on the tree. I give my trees no fertilizer; I only keep a thick mulch under them. I don’t want to encourage them to grow too vigorously, which would only create more pruning work. Tom Spellman of Dave Wilson Nursery prunes fruit trees plus gives some of his reasoning in this video titled “Winter Pruning.” Perhaps the best thing about this video is that you can watch Spellman make the cuts; then you can go out to your tree and imitate if you like. I’m sure you’ll find it useful to watch some of the many other videos Spellman has done on pruning too. Fruit Trees: Training and Pruning Deciduous Trees by Chuck Ingels (again), Pam Geisel, and Carolyn Unruh. The information is dense, but it’s all there, and it’s freely available as a pdf. It’s kind of like the condensed version of the book The Home Orchard. What is your advice if I have already made the mistake of letting my tree grow to 15 feet? Will it hurt my tree to prune it way back? That’s a good question. I’ve tried it and found mixed success. Watch the Chuck Ingels “Home Orchard Part 2” video that I mentioned, starting at 13 minutes 30 seconds. 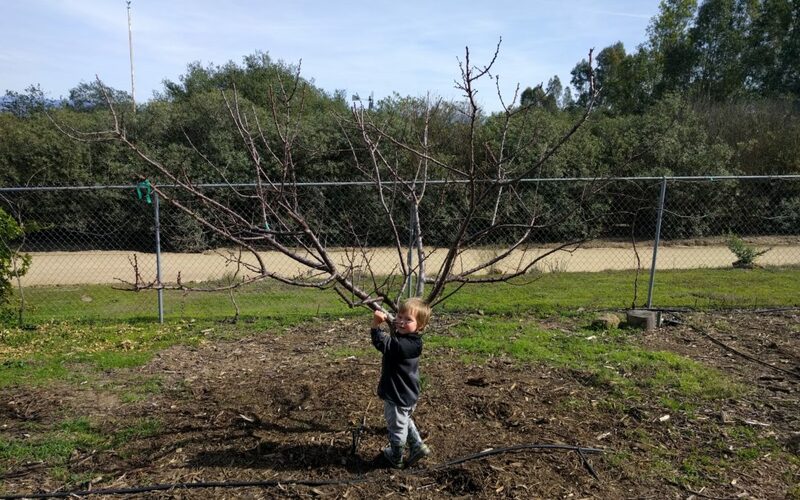 He talks about two methods for reducing the size of big fruit trees. I’ve personally had more success with the method of bringing down the size incrementally over the span of a few years rather than a drastic reduction at once. And you definitely can’t forget to paint exposed branches because they will sunburn. That being said, if a tree is not just big but also old and not so healthy, I would save the work and pass up the risk of heavy pruning and just plant a new tree.